© 2016 The Korean Society for Plant Biotechnology. Received February 11, 2016; Revised March 10, 2016; Accepted March 15, 2016. The genus Cypripedium, known as lady’s slipper orchid, has been considered to have a considerable marketability as a potted and garden plant with beautiful flowers; however, this species is becoming endangered and, in some places extinct, due to habitat destruction and illegal collections. As such, an optimized artificial propagation system is necessary for its conservation and horticultural cultivation. For the establishment of the in vitro proliferation of the endangered Cypripedium macranthos Sw., native to Korea, the effects of medium strength and sucrose concentrations on germination, protocorm formation and seedling growth were investigated through asymbiotic seed culture. The highest germination rate and protocorm formation rate were obtained with a 1/4 MS medium; higher MS medium strengths did not generate the favorable conditions required for germination and protocorm growth. The overall growth characteristics of roots and buds developed from protocorms were best in cultures of 1/4 MS medium. On this medium containing 10 g·L-1 sucrose, both the germination rate and protocorm formation rate increased significantly. The general growth properties of seedlings developed on the medium with 10 g·L-1 sucrose were best, showing the highest bud formation rate and root number. Our results demonstrate that the 1/4 MS medium, supplemented with 10 g·L-1 sucrose, could improve in vitro germination, and facilitate the growth of seedlings developed from the protocorms of C. macranthos Sw. The genus Cypripedium belongs to the subfamily Cypripedioideae within the family Orchidaceae. Their members are commonly called lady’s slippers because of the slipper-like appearance of their flowers. This genus comprises 58 species and four varieties (Cribb 1997; Wu et al. 2009). It is classified as the terrestrial and temperate orchid, and commonly distributed throughout the Northern Hemisphere. Unfortunately Cypripedium species is becoming extinct due to the destruction of native habitats, ecological disturbance and illegal collection for horticultural and medicinal purposes (Cribb and Sandison 1998). C. macranthos Sw. is widely found from Eastern Russia, Northern China, Japan, Korea and Taiwan, but its population and abundance have been also recently reduced in Korea. It has been officially recorded in over 50 localities on the Korean peninsula, however, the numbers of individuals and subpopulations have decreased extremely as a result of over-collection and less than ten extant subpopulations are known in South Korea (Lee and Choi 2006). In vitro seed germination is a powerful method to preserve native, rare and overcollected orchid species, producing and maintaining a large number of its population (Texeira da Silva 2013). Particularly, asymbiotic germination has been usefully applied for commercial propagation of orchids. But the orchids of temperate terrestrial origin have been still difficult to propagate in vitro (Arditti and Ernst 1992; Rasmussen 1995) and the poor germination or plantlet death have occurred frequently (Malmgren 1988). Of the subfamily Cypridedioideae, four genera (Cypripedium, Paphiopedilum, Phragmipedium and Selenipedium) are considered to be more difficult to culture in vitro, as compared to the epiphytic orchids, and Cypripedium species is known to have the most intricate culture conditions (Arditii and Ernst 1984; Arditti 2009; Rasmussen 1995). Many studies have recommended that the most effective propagation method of Cypripedium species is in vitro seed germination (Arditti 1967; Arditii and Ernst 1992). However, its germination depends on many factors including seed collection time, habitat location, season and growth stage (Arditti 1967; Ballard 1987; Harvais 1982). Many in vitro cultural conditions including physical and nutritional parameters can also affect the germination of Cypripedium. In particular, medium types, plant growth regulators, carbohydrates, organic amendments, vitamins and other components have been tested for the improvement of Cypripedium seed germination and its protocorm development (Deng et al. 2012; De Pauw et al. 1993, 1995; Harvais 1982; Piao et al. 2011; Rasmussen 1995; Yan et al. 2006). In this study, we tried to investigate the effects of medium strength and sucrose concentration on in vitro germination, protocorm formation and seedling growth, and refine the in vitro culture medium composition for the successful proliferation of C. macranthos Sw.
C. macranthos Sw. have been cultivated in field and greenhouse at Chungcheongbuk-do Agricultural Research and Extension Services. During blooming season (from April to June), the flowers were cross-pollinated manually by transferring pollinia onto the stigma of the other flower. Seed capsules were harvested at 75 days after cross-pollination. They were brought to the laboratory and prepared for inoculation onto medium on the same day. In a laminar flow hood, whole seed capsules which were not injured by insects such as leaf-miners were surface-sterilized in 3% (v/v) sodium hypochlorite solution for 15 min and rinsed three times in sterile distilled water. Capsules were cut and their seeds were scooped out with forceps onto the culture medium. The seeds were incubated in darkness at 23 ± 2°C during 5 months. Effect of basal medium strength on in vitro germination, protocorm formation and seedling growth of C. macranthos Sw. The seeds from surface-sterilized capsules were sown on each Murashige and Skoog (MS) medium (Murashige and Skoog, 1962) with different strengths (2, 1, 1/2, 1/4 and 1/8). This basal medium was supplemented with 10 g·L-1 sucrose, 100 ml·L-1 coconut water and 7 g·L-1 agar. The pH was adjusted to 5.8 before autoclaving. 100 ml of medium was poured onto each plant culture dish (Φ100 x h40 mm). This experiment was designed randomly. Each treatment had ten replicates and was conducted three times. Ten seed capsules were collected, and the seeds from each capsule were equally distributed into each replicate of five MS medium with different strengths. After sowing, the seeds were incubated in darkness at 23 ± 2°C during 5 months. After 2 months of culture, the germination rate (the percentage of the number of seeds germinated among the total countered number of seeds) was calculated. Germination indicated the emergence of the full embryo from the testa. After 3 months of culture, the protocorm formation rate was also calculated as the percentage of the number of young protocorms with promeristem among the total germinated seeds. After 5 months of culture, the growth characteristics of young seedlings developed from protocorms were measured. Effect of medium sucrose concentration on in vitro germination, protocorm formation and seedling growth of C. macranthos Sw. The seeds from surface-sterilized capsules were sown on the each MS medium with different sucrose concentrations (0, 10, 20, 30 and 40 g·L-1). This basal medium was the quarter- strength MS medium with 100 ml·L-1 coconut water and 7 g·L-1 agar. The pH was adjusted to 5.8 before autoclaving (at 121°C and 1.2 kgf·cm-2 pressure for 15 min). 100 ml of medium was poured onto each plant culture dish (Φ100 x h40 mm). This experiment was designed randomly. Each treatment had ten replicates and was conducted three times. Ten seed capsules were collected, and the seeds from each capsule were equally distributed into each replicate of basal MS medium with 5 different concentrations of sucrose. After sowing, the seeds were incubated in darkness at 23 ± 2°C during 5 months. The germination and protocorm formation rate as well as the growth characteristics of young seedlings were measured as mentioned above. Data from each experiment were subjected to Duncan`s multiple range test using SAS program (Version 6.21, SAS Institute Inc., Cary, NC, USA). From the preliminary studies we found that MS medium was the good basal medium for germination and protocorm growth of C. macranthos Sw. (Huh 2015). Therefore, the accurate MS medium strength was tried to be found for acquisition of well-defined in vitro medium composition in this study. 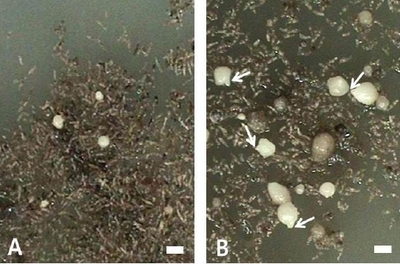 Figure 1 showed the seed germination and protocorm development of C. macranthos Sw. after in vitro seed inoculation. After 2 months of culture, seed embryos were swollen and seed coats were ruptured. And they were transformed into the young protocorms and the meristematic dome (promeristems) were formed at the basal parts by 3 months. After then, the young protocorms were elongated, presumably owing to the cell division of the newly organized shoot and root apical meristem. Zeng et al. (2014) also reported that this meristematic tissue of protocorm led to the generation of a scale and apex of seedlings. When the embryo of Orchidaceae is transformed into a protocorm, its cells are arranged along a longitudinal axis according to size and the meristematic tissue is developed at the anterior pole. During these developmental processes, the apical shoot and root meristems are newly differentiated from these meristematic tissues (Rasmussen 1995). Table 1 showed that the highest germination rate (68.1%) and protocorm formation rate (70.1%) were obtained from 1/4 MS medium. Higher MS medium strength could not make the favorable condition for germination and protocorm growth of C. macranthos Sw. When the seeds were cultured on MS and 2 MS medium, both germination and protocorm formation rate decreased by 40~65% and 38~48% respectively, as compared with 1/4 MS medium. zMean separation determined by Duncan’s multiple range test at P ≤ 0.05. Table 2 and Figure 2 also showed that the overall growth characteristics of seedlings developed from protocorms were best in culture of 1/4 MS medium. The fresh weight and dry weight of seedling were shown to be doubled in 1/4 MS medium. Roots were almost formed from young protocorms in all treatments, but their number and length increased respectively by 1.6~2.2 times and 1.25~1.7 times in 1/4 MS medium, as compared with other MS medium with higher strength. The formation rate of buds and their length also increased respectively by 11~32% and 25~45% in comparison with MS and 2 MS medium. 1/8 MS medium, which has the severely diluted macroelements, could not promote the germination, protocorm and seedling growth, resulting from the depletion of nutrients during the long-term culture period. The differentiation of buds which would develop into the new shoots during ex vitro acclimatization is very critical for seedling survival and growth of C. macranthos Sw. If the buds were not formed from protocorms or did not grow vigorously, the young seedlings could not maintain their growth and develop into the adult plants. Therefore, it is very important to find the optimum culture conditions to induce the generation of buds from protocorms and keep their growth healthy during in vitro culture period. A number of medium compositions for temperate terrestrial orchids have been developed through some modifications of salt components, the mineral salt concentration has been commonly reduced and organic compounds increased (R?nnb?ck 2007). Various studies also reported that the traditional tissue culture media have been found to be too concentrated for temperate orchids, therefore, should be diluted approximately 2 to 10 times (Harvais 1974; Rasmussen 1995; Van Waes 1984). Cypripedium species has been proved to prefer a low salt medium (Piao et al. 2011; Van Waes and Debergh 1986). Fast (1982) also recommended the use of growth media with less than 0.25 to 1.0 g of inorganic salts. At 42 days after pollination (DAP), the germination rate of three Cypripedium species was highest and the protocorm development was faster on 1/2 Norstog macroelements at all periods of collection (De Pauw and Remphrey 1993). In the cases of other orchids such as Dendrobium tosaense and Paphiopedilum armeniacum, the optimum basal medium for seed germination and subsequent protocorm development was respectively half-strength and eight-strength MS medium (Udomdee et al. 2014; Zhang et al. 2015). The actual germination might benefit from low osmolarity and complete absence of mineral salts (Rasmussen 1995). Therefore, it was suggested that the low level of inorganic salts in diluted medium could efficiently improve the germination and protocorm development, furthermore, induce the vigorous seedling growth during asymbiotic seed culture of C. macranthos Sw. When seeds were sown and incubated on 1/4 MS medium containing 10 g·L-1 sucrose, the germination rate (65.8%) and protocorm formation rate (74.7%) increased most significantly (Table 3). Table 3 and Figure 3 also showed the best general growth properties of seedling differentiated on 1/4 MS medium supplemented with 10 g·L-1. The fresh weight and dry weight increased by more than 2 times in comparison with 1/4 MS medium with 30 g·L-1 and 40 g·L-1 sucrose. The growth of roots and buds were also superior to the other high sucrose levels, particularly, the root length increased by 23~50%, and the bud formation rate and its length increased by 16~25% and 30% respectively. For in vitro germination and growth, some terrestrial orchids species can germinate on pure water-based agar media (Rasmussen 1995), but Cypripedium species generally requires soluble sugars. Carbohydrates serve as an energy source in the medium, while they also act to supplement osmotic pressure in the culture of plant cells and affect the orchid seed germination and protocorm development significantly. In particular, sucrose is considered as the important carbon and energy source, because it is the most common carbohydrate in phloem sap and involved in controlling developmental processes (Gibson 2000). Sucrose could provide a balanced carbon source for cell growth with the released hexoses directly participating in glycolytic and pentose phosphate pathways (Zha et al. 2007). Soluble sugars in asymbiotic media are usually added in concentrations between 10 and 30 g·L-1 in the form of glucose, fructose or sucrose (Knudson 1946; Rasmussen 1995; Van Waes 1984). However, higher amount of sucrose could retard the development of cultured cells by causing a cessation of the cell cycle when nutrients were limited (Gould et al. 1981; Wu et al. 2006). Deb and Pongener (2011) reported that the different concentration of sucrose affected on the immature seed germination of Cymbidum aloifolium, and Johnson et al. (2011) mentioned that increasing sucrose concentration from 10 to 50 mM resulted in poor germination and development of Bletia purpurea. Other researchers also claimed that the addition with high concentration of sucrose in the culture medium might have inhibitory effect on nutrient uptake by lowering water potential of the medium (Shim et al. 2003), and induce the osmotic stress (Shohael et al. 2006). Therefore, in this experiment, it could be conjectured that 10 g·L-1 sucrose might induce the optimal osmotic potential that facilitates in vitro germination and seedling growth from protocorm of C. macranthos Sw. during its culture period. Arditti J. (1967) Factors affecting the germination of orchid seeds. Bot Rev 33, 1-97. Arditti J. (2009). Micropropagation of orchids (Ed.) , pp.489. John Wiley and Sons, Inc, New York, USA. Arditti J, and Ernst R. (1984) Physiology of germinating orchid seeds. Orchid biology:reviews and perspectives III, Arditti J (ed.) , pp.176-222. Cornell University Press, Ithaca, New York, USA. Arditti J, and Ernst R. (1992). Micropropagation of Orchids , pp.682. John Wiley and Sons, Inc, New York, USA. Ballard WW. (1987) Sterile propagation of Cypripedium reginae from seeds. Amer Orchid Soc Bull 56, 935-46. Cribb P. (1997). The genus Cypripedium , pp.301. Timber Press, Portland, USA. Cribb P, and Sandison M. (1998) A preliminary assessment of the conservation status of species in the wild. Bot J Linnean Soc 126, 183-190. Deb CR, and Pongener A. (2011) Asymbiotic seed germination and in vitro seedling development of Cymbidium aloifolium (L.) Sw.:a multipurpose orchid. J Plant Biochem Biotechnol 20, 90-95. Deng L, Zhang Y, Wang MM, and Zhao SW. (2012) Study on non-asymbiotic germination of Cypripedium macranthos seed. Seed 31, 31-39. De Pauw MA, and Remphery WR. (1993) In vitro germination of three Cypripedium species in relation to time of collection, media and cold treatment. Can J Bot 71, 879-885. Fast G. (1982) European terrestrial orchids (Symbiotic and asymbiotic methods). Orchid Biology. II. Reviews and perspectives. Orchid seed germination and seedling culture - a manual, Arditti J (ed.) , pp.309-326. Cornell University Press, Ithaca, New York, USA. Gibson SI. (2000) Plant sugar response pathways. Part of a complex regulatory web. Plant Physiol 124, 1532-1539. Gould AR, Evereet NP, Wang TL, and Street HE. (1981) Studies on the control of cell cycle in cultured plant cells. I. Effect of nutrient limitation and nutrient starvation. Protoplasma 106, 1-13. Harvais G. (1974) Notes on the biology of some native orchids of Thunder Bay, their endophytes and symbionts. Can J Bot 52, 451-460. Harvais G. (1982) An improved culture medium for growing the orchid Cypripedium reginae axenically. Can J Bot 60, 2547-2555. Huh YS. (2015) Establishment of in vitro proliferation and cultural practice of endangered Cypripedium macranthos Sw. through asmybiotic seed culture. Chungbuk National Unv. Korea. PhD Diss . Johnson TR, Kane ME, and Perez HE. (2011) Examining the interaction of light, nutrients and carbohydrates on seed germination and early seedling development of Bletia purpurea (Orchidaceae). Plant Growth Regul 63, 89-99. Knudson L. (1946) A new nutrient solution for the germination of orchid seeds. Bot Gaz 73, 1-25. Lee JS, and Choi BH. (2006) Distribution and red data of wild orchids in the Korean Peninsula. Kor J Plant Taxon 36, 335-360. Malmgren S. (1988) Fr?f?r?kning av Dactylorhiza i stor skala ?en kort manual. Svensk Botanisk Tidskrift 82, 61-166. Murashige T, and Skoog F. (1962) A revised medium for rapid growth and bio assays with tobacco tissue cultures. Physiologia plantarum 15, 473-497. Piao RZ, Wang YL, and Zhao HY. (2011) Preliminary exploration in in vitro seed culture conditions of Cypripedium macrnathos Sw. J Anhui Agri Sci 39, 18428-18429. R?nnb?ck L. (2007) Propagation, cultivation and breeding of terrestrial temperate orchids, with focus on Cypripedium spp. Dept of Crop Science, SLU, Bachelor project in the Danish- Swedish Horticulture programme 1. Rasmussen HN. (1995). Terrestrial Orchids:From Seed to Mycotrophic Plant , pp.444. Cambridge University Press, New York, USA. Shim SW, Hahn EJ, and Paek KY. (2003) In vitro and ex vitro growth of grapevine rootstock &apos;5BB&apos;as influenced by number of air exchanges and the presence or absence of sucrose in culture media. Plant Cell Tiss Organ Cult 75, 57-62. Shohael AM, Chakrabarty D, Ali MB, Yu KW, Hahn EJ, Lee HL, and Paek KY. (2006) Enhancement of eleutherosides production in embryogenic cultures of Eleutherococcus sessiliflorus in response to sucrose-induced osmotic stress. Process Biochem 41, 512-518. Texeira da Silva JA. (2013) Orchids:Advances in tissue culture, genetics, phytochemistry and transgenic biotechnology. Floriculture and Ornamental Biotechnology 7, 1-52. Udomdee W, Wen PJ, Lee CY, Chin SW, and Chen FC. (2014) Effect of sucrose concentration and seed maturity on in vitro germination of Dendrobium nobile hybrids. Plant Growth Regul 72, 249-255. Van Waes J. (1984) In vitro studie van de kiemingsfysiologie van Westeuropese orchidee?n. Diss, Rijksuniversiteit Gent, Faculteit van de Landbouwwetenschappen . Van Waes JM, and Debergh PC. (1986) In vitro germination of some Western European orchids. Physiologia Plantarum 67, 253-261. Wu CH, Dewir YS, Hahn EJ, and Paek KY. (2006) Optimization of culturing conditions for the production of biomass and phenolics from adventitious roots of Echinacea angustifolia. Plant Biol 49, 193-199. Wu ZY, Raven PH, and Hong DY. (2009) Flora of China. (Ed.). (Orchidaceae) 25, pp.22-33. Science Press and St. Louis:Missouri Botanical Garden Press, Beijing, China. Yan N, Hu H, Huang JL, Xu K, Wang H, and Zhou ZK. (2006) Micropropagation of Cypripedium flavum through multiple shoots of seedlings derived from mature seeds. Plant Cell Tiss Org Cult 84, 113-117. Zeng S, Zhang Y, Jaime A, Teixeira da Silva JA, Wu K, Zhang J, and Duan J. (2014) Seed biology and in vitro seed germination of Cypripedium. Crit Rev Biotechnol 34, 358-371. Zha XQ, Luo JP, Jiang ST, and Wang JH. (2007) Enhancement of polysaccharide production in suspension cultures of protocorm- like bodies from Dendrobium huoshanense by optimization of medium compositions and feeding of sucrose. Process Biochem 42, 344-351. Zhang YY, Wu KL, Zhang JX, Deng RF, Duan J, Da Silva JAT, Huang WC, and Zeng SJ. (2015) Embryo development in association with asymbiotic seed germination in vitro of Paphiopedilum armeniacum S.C. Chen et F.Y. Liu. Sci Rep 5, 16356.